As IDF reveals weapons cache, Gaza city unveils statue of M75 rocket, honoring 'battle against Zionist enemy.' Hamas: the North is next. Hamas displayed bravado Monday, as it unveiled a rocket-shaped 'statue' showcasing its capacity to strike Israel at the same time the Jewish state exposed its haul of the Iranian weapons ship arming the terror organization. "Hamas managed to take the battle to the heart of the Zionist entity (Israel) after developing its rocket system, succeeding where many Arab armies had failed," said a leader of Hamas armed wing the Al-Qassam Brigades, flanked by masked fighters at the statue's unveiling, according to AFP. 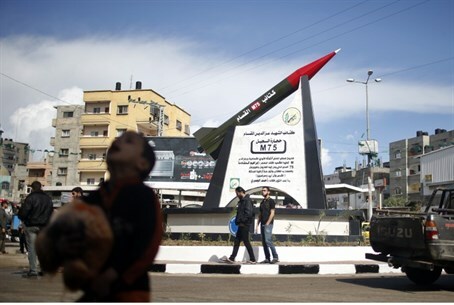 The monument in Gaza City features an actual-size model of a large M75 rocket. The 'M' honors Qassam Brigades founding member Ibrahim al-Maqadma -- who was killed by Israel in 2003 -- and the number alludes to its range of 75 kilometers. M75 rockets were fired from Gaza during its last major assault on Israel, Operation Pillar of Defense, in November 2012. They struck areas around Tel Aviv and Jerusalem, almost 70 kilometers (40 miles) away. A Hamas official at the Gaza City ceremony told AFP, on condition of anonymity, that in any future confrontation with the Jewish state, cities in the far north of Israel would be targeted. Hamas timed the ceremony to coincide with Israel's unveiling of the Iranian weapons ship headed for Gaza, the Klos C. The IDF spokesperson's office announced Sunday that the cargo of the Klos C, which docked in Eilat over the weekend, has been offloaded and all the contents examined. The list includes: 40 M-302 rockets, with a range of 90 to 160 km; 181 mortar shells, 122 mm caliber; and about 400,000 bullets, 7.62 caliber - which are usually used in Kalashnikov-type assault rifles. Speaking to the press at Eilat port, in view of the ship's deadly cargo, Prime Minister Binyamin Netanyahu noted - in both Hebrew and English - that the assorted rockets, mortars and other munitions were meant "for fatal purposes against Israel to hurt Tel Aviv, Jerusalem, and even Haifa". "The goal was to have rained down on the heads of Israel's citizens," he said. "We are revealing the truth behind the deceiving smiles of Iran, to expose the delusion that Iran is changing direction," he continued. Netanyahu noted that the international community's decision to downplay the IDF's find is "evidence of the era of hypocrisy in which we are living." "My message today is simple: those engaged in self-deception must waken from their slumber, we cannot allow Iran to continue building nuclear weapons. Today, Israel exposed Iran's attempts against its people," he continued, "Tomorrow, the whole world could be involved."